After a 2-hour minivan ride we arrived to the Vietnam border. We had our temperatures taken and filled out paperwork stating we were not experiencing various symptoms. Our $1/pp bribe make the entire experience go by quicker. At the other side we waited for 30 minutes and were picked up by some woman in a very old minivan. She dropped us off at another local tourist agency where we waited for our final bus to deliver us to Can Tho. After 9+ hours of travel we finally arrived in Can Tho. Our workaway host, Dung, and her boyfriend picked us up at the bus station. We hopped on the back of their scooters, along with both of our bags, and rode to a noodle restaurant for dinner. It was a bit awkward since we had both our bags and were pretty drained from 9 or 10 hours of traveling. I ordered the crab, but the half crab I got didn't have much meat in it. Later that evening we met the family--Dung's two younger sisters and her parents. She shares a room with her older sister, while her younger sister shares a room with her mom. Her dad gets his own room. The entire family was asking us questions, though only Dung is fluent enough to be conversational. We showed them pictures of our travels. They really seemed interested in seeing currency from other countries. In Vietnam it's illegal to exchange their currency for others. I exchanged $20 USD with Dung's boyfriend--he seemed excited to have USDs. It is unusual for families to have separate rooms for sleeping here in Vietnam--this actually goes for most of SE Asia though. I'm sure the fact that Vietnam is so densely populated only serves to make this more noticeable. People sleep on straw mats or small cots and it's typically don't use mattresses. Mosquito nets protect them from the bugs at night. The family hosting us had a relatively large house and rented another smaller unit a few doors down. Dung said they typically rent the space for $50/month. Our place was the same as every other unit on our alley, except for Dung's house. We had first floor of approximately 125 square feet of living space and a lofted space of another 75 square feet. We had a squat toilet and a small faucet in the back of the first floor. It was very interesting to learn that families of 4-6 shared the same small space. Looking through the lens of a Vietnamese person one can see how wasteful a room only for sleeping really is. The next morning the four of us took off for a day of adventure. We doubled up on the back of the motos. While in Kampot I thought the gearing of my motorcycle was a bit off but I understand why now. When riding solo I never used the first 2 gears and I was even able to start the motorcycle in top gear. It's common to have 3 or more people riding on a motorcycle along with baskets and groceries. When the bikes are loaded this much the low gears are required. These bikes were made with the intent to carry many hundreds of pounds--quite a shock considering that they are only 110cc. We went to a local Cocoa farm. The owner had started the farm many decades ago after learning how to fly a helicopter in America--he helped the south fight in the American War, A.K.A. the Vietnam War. He had purchased a book in French and read everything he could on chocolate making (obviously there were no books in Vietnamese). He built the farm and business from the ground up and now export his beans to the US, Belgium, and France. He still does everything by hand and does not use chemicals. During our tour we met two Dutch people, the only other white people we've seen while our entire time in Can Tho. After the visit to the cocoa farm we took an hour ride to Sang's house. The house was a single story home in the country 100 feet off from one of the hundreds of canals running through the Mekong Delta. There were 4 generations living together in the house. The farm in back was comprised of orderly fenced off crops. 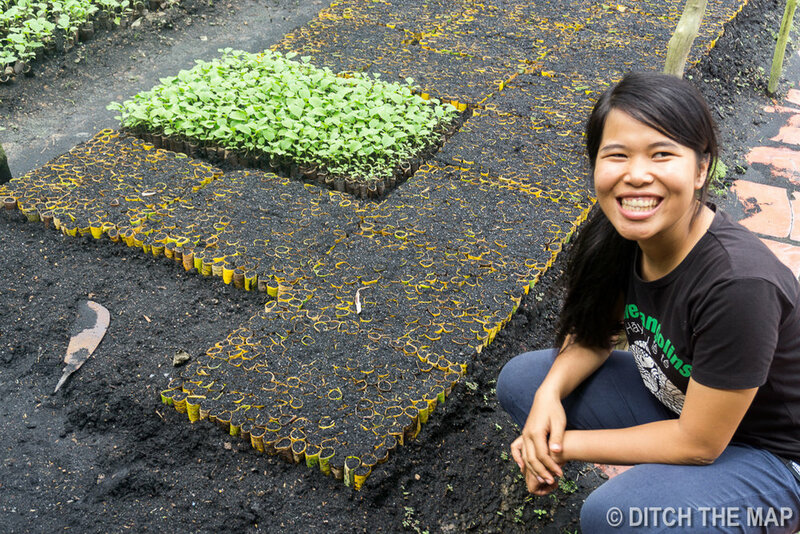 They use banana leaves to retain soil and grow seedlings. Across the street they had larger sections of land devoted to growing rice, papaya, chilies, mangos, and various other fruits. The farm had two aggressive dogs that were chained up. I don't think these dogs are ever taken off the chains. They are the farm's security system. While walking through the vast farm we saw the 3rd generation couple (man and his wife) working in the fields. The couple we saw working the fields were married through an arranged marriage, typical in these parts of rural Vietnam. As Dung is not yet married and lives closer to a city she is thought of as, being 'naughty'. She receives incessant inquirers about her marriage status and when she'll be having children. Children are almost thought of as assets in these rural parts since they can farm and provide for the elderly. I find it a selfish for parents to expect their children to sacrifice their lives in order to take care of them, but this is just a different mindset. Vietnam has had a 2-child policy for nearly 40 years. Vietnamese has a heavy bias towards wanting male children, which has resulted in a higher number of aborted females than males. Vietnam has the highest abortion rates in the World--2 out of 5 pregnancies end in abortion (about the same as in NYC). Vietnam's 2-child policy has helped to reduce the number of fertility rate but now is below the replacement rate. The government has plans to abandon the policy. Shoes are never worn inside a house and one should never point the bottom of their feet to anybody. Upon entering a home it is customary for the host to bring the guest something to drink, usually water. We were offered durian-flavored mid-autumn cakes. These cakes are similar to mooncakes, but are only sold for 2 days in the year--only during mid-autumn. Mooncakes are sold everywhere along the street. 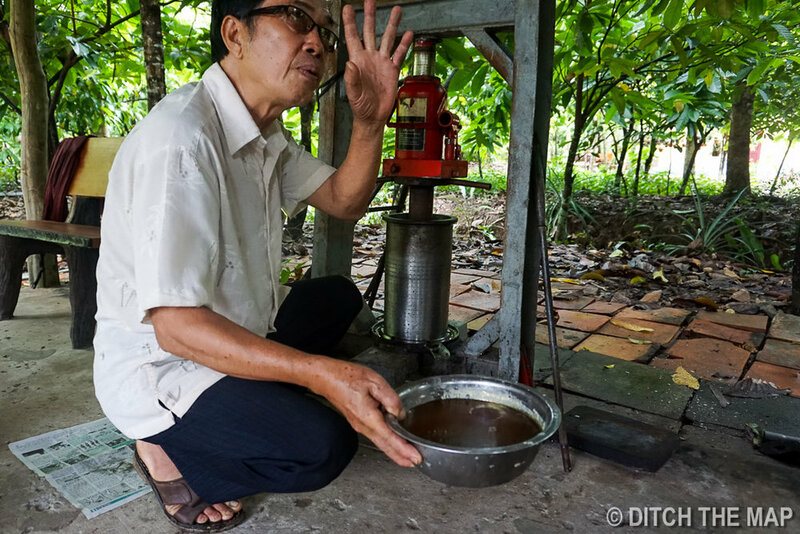 During the time Dung was showing us around the farm the grandmother came back to the house. We had to return to the family home and greet the grandmother. I took off my hat and said, "xin chao” (seen chow) as I bowed my head crossed my right arms across by body. It is customary to to cross the arm across the chest with a box in Vietnam while in other places, such as Thailand, hands are placed together with a bow. While walking in the fields Dung talked to us about traditional beliefs, marriage customs, and domestic violence. When families make extra money from their crop they buy gold and hold onto it. They do not use banks. The men can then offer the gold to a prospective female's family in order in attaining her hand in marriage. This custom is similar to that in Cambodia. 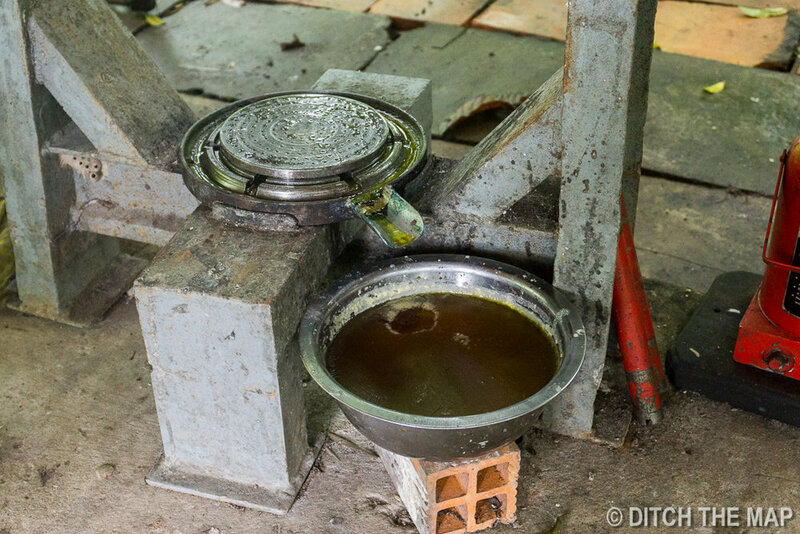 After an inquiry I made Dung made it clear that people don't think to save the money to invest in machinery or to grow their farming operation in hopes of making more money or providing more opportunities for their future or the future of their children. Where western culture, mainly American culture, is overly concerned about making more money/improving their conditions (the only reason why people have been against our trip), South Asian culture has the complete opposite view. Both views are extreme and illogical, but I understand why they exist. Without being able to live and experience both cultures one is just ignorant to other 'ways' of life. It's important to have goals and aspirations, that is what makes us humans so unique from other lower primates. It has given us modern medicine, transportation, and modern language. However when gone unchecked, as it has in the massively materialist United States, productivity has turned into an end unto itself. People sit restlessly toying away at their phones at dinner tables, playing mindless electronic games on the subway, and feel compelled to work on their short 2 week vacation, etc. The DSM has given validity to 'disorders' that are largely manifested by our own culture. We dispense Prozac, Adderall, and Xanax for 'diseases' that are a result from our own lifestyle. The East practices mediation, a way to calm the mind, and focus on how our own body and mind are separate and that we have the ability to direct our own emotions. In the West mediation is a fun class one takes and then talks to a friend about it over a cup of coffee to make it through the day ahead. People try to make as much money as possible while neglecting the most important factor in life...happiness. Money can buy pleasures--large TVs, new phones, fancy cars, interesting food--but it cannot buy happiness. Happiness is a state of equilibrium. Happiness exists when doing the laundry, walking to work, or reading a book in the park. Pleasures are unstable and short-lived. Therefore one must always earn more money to have their pleasures fulfilled. After more than a combined year and a half of long-term travel I have found that the ultimate struggle in life is this: To balance the 'western' drive to busy one's self with the 'eastern' drive to be content with the now. This has been my major revelation during travel--an ongoing Yin-Yang relationship I'll continue to explore. Upon my request we went out to eat some food. Dung's older sister and dad came along as we went to a local restaurant that only served dog meat. I ordered two different items. The first was meat from the belly while the second dish consisted of organ meat. 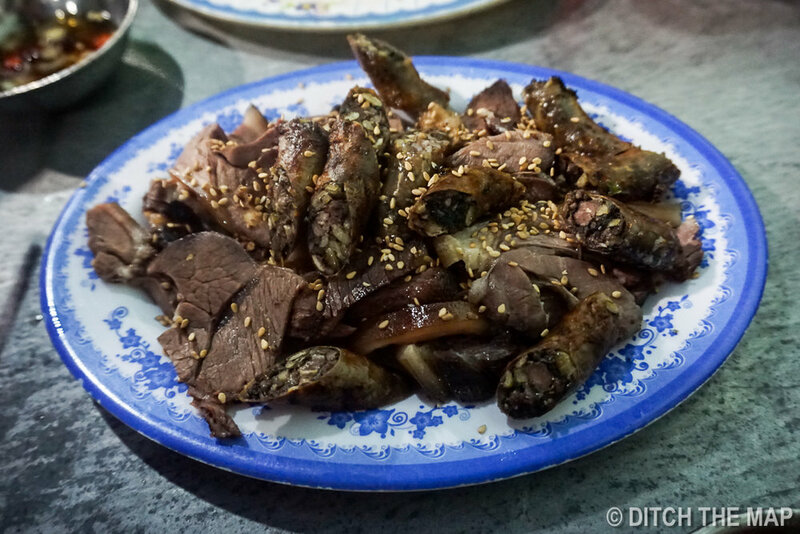 The dog meat was fabulous and tasted similar to pork. Each platter cost less than $2.75. I ate it with various greens and a cooked banana and dipped it into fish sauce. I learned how many of the dogs eaten in Vietnam are actually stolen pets and that some thieves can earn as much at $100 for one dog. Growing up Dung had a pet dog and after a year or two her father killed it and prepared it for dinner. Dung ate it but now doesn't eat dog meat. On the way out of the restaurant a group of young men called me offer and offered me a drink of rice wine. I took a shot with them and ended the experience in style. Afterwards we met a couple of Dung's friends at a street-side food stall. The owner of the food stall was actually our neighbor. We spoke english to her friends who were learning and ate balut, which is a cooked duck embryo that is between 14 and 21 days old. Balut is a very common delicacy in Vietnam. Each egg costs only 5,000 dong (<$0.25 USD). Dung took the egg apart and showed various parts of the developing bird. The large blood vessels around the yolk was the first thing we saw. As she continued to dissect the substance we saw the head, the large eyes, the beak, and it's legs. I was underwhelmed and thought it tasted a bit tough. However the head was very delicious. Sylvie chickened out and didn't try it--mind my pun. I had asked about eating cat meat and Dung had asked her father if he could take us. We had to go early as there is only 1 place around town that serves it and they close early. We hopped onto the back of Dung and her father's motorcycle and rode 20 minutes outside of town to a small alley with an assuming restaurant. 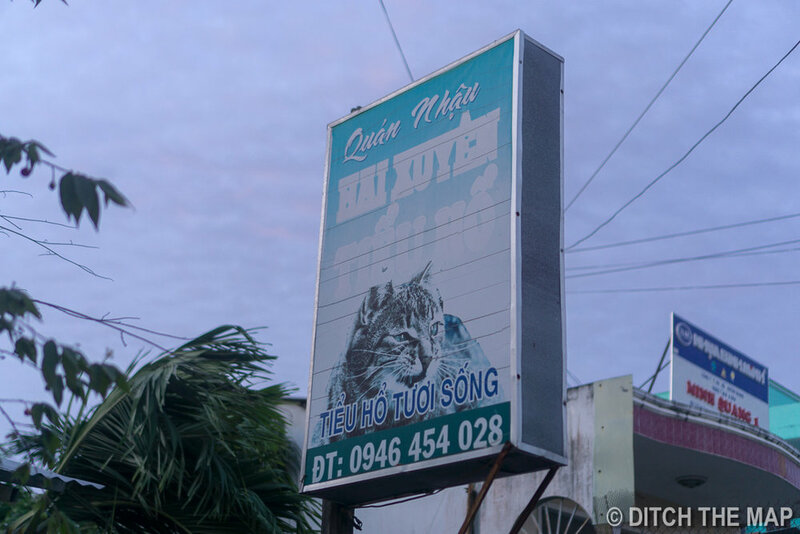 There was a large picture of a cat on the poster. While dog meat is enjoyed along cold beers cat meat is accompanied with rice wine. We ordered 2 different dishes of cat and a bottle of rice wine. Her dad kept filling my glass up, but only filled Sylvie's up a few times...and only half way. There were NO other women eating here. Same for the Dog restaurant. Dung explained that "women just don't like dog or cat meat". She then explained how "only hard workers eat here". The cultural differences between us were clear but I think she meant that it's very blue collar and it's not ladylike. Like drinking Budweiser and watching nascar on the porch. As we dined, various men from several tables, stopped over to show their respects and offered to take shots with us. It was a very communal feel and we continued to drink with various men throughout our entire meal. The price for 2 dishes and a bottle of what could only be homemade rice wine cost 165k dong ($7.50). The rice wine was served in a recycled water bottle. Afterwards we enjoyed duck hot pot with 2 of Dung's friends who were learning English. Dung introduced us to her friend Jenny. We met with her for coffee and helped her with her English. We went over various English idioms. She has invited us to join her, and 3 of her friends, on a 2-day trip to Con Son Island off the coast of South Vietnam. Although we had to cancel a dentist appointment and a non-refundable deposit for a hotel we decided we couldn't miss out on the opportunity. That evening Jenny invited use to an English club meeting at the Tiny Corner Cafe. For a little over an hour Sylvie and I chatted with dozens of eager students practicing their English. It was refreshing to see such a progressive demographic here in Vietnam. A university history teacher, a medical student, and dentist in training were among the mix. Many of their English skills were remarkably good--a shocking sight given that nothing here is in English. Many of them expressed their own desires to travel but that since salaries are so low in Vietnam it is a hard goal to achieve. It was the first time since traveling outside of Europe that we had heard such strong feelings in favor of travel. It's a shame since their salaries are so low though. Shockingly I don't really know anybody in America that could NOT afford it. Cruel fate! A short walk down by the river and an overpriced salad and pizza ended our long day. Waking up at 4:30 sharp after 4 nights of sleeping on a hard pillow-less straw mat was no easy feat but I forced myself out the door. Sylvie, on the other hand, needed her sleep so I went solo to the Cai Rang floating market. Riding my motorbike through the streets of Vietnam early in the morning was almost easy--nothing compared to the chaotic busier times of the day. Locals were already eating breakfast and setting up their places of business. Vietnam has a early riser culture. Work usually begins at 7am and goes to 5pm, but the day is often broken up by a 2-hr lunch. Individuals used to return to their homes to eat lunch with their families but this tradition is changing, in favor of eating closer to work. Work in less-developed countries is not the same as in developed countries. Although they are 'at' work they have much down time where they socialize with their friends. So it's important to put things into perspective. Also, many people don't have the usual 5-day on 2-day off schedule to which we've grown accustomed. 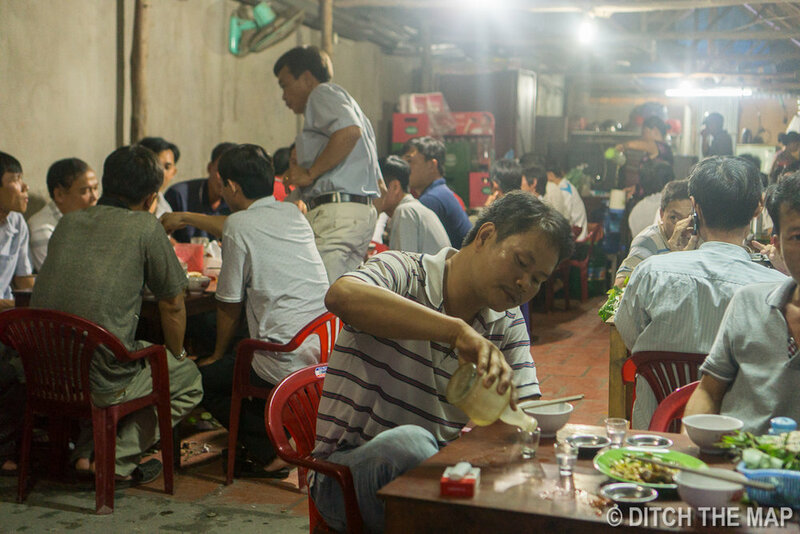 Many locals spend their nights socializing with friends over dinner. Unlike in America where we go to restaurants and spend $15+ apiece (meal + tax + tip) people in Vietnam typically spend 15k to 25k dong for their meals. However, even though they're spending ~$1 USD for a large meal it's not chump change given that their minimum wage is as low as $0.65/hr. I bargained for a private boat. 250k dong ($11 USD) for 3 hours was good enough for me--the same boat was selling for $25-$35 from agencies across the street and well over $60 if going through an online provider. The short distance took more than 45 minutes on the dinky boat and even dinkier propeller. The market was for wholesalers and not geared towards tourists. Although I did see some private boats there were in the single digits. I was accompanied by only a handful of other white people on the entire river. Since I've gone days without seeing another westerner I have concluded that they must all be on the river. In truth, Can Tho is an unpopular tourist destination and most westerners that visit the area come for day trips to the floating market(s) and noodle factories.